Our premium regulated CO2 charger brings the function of a full-size regulator to a portable, handheld package. 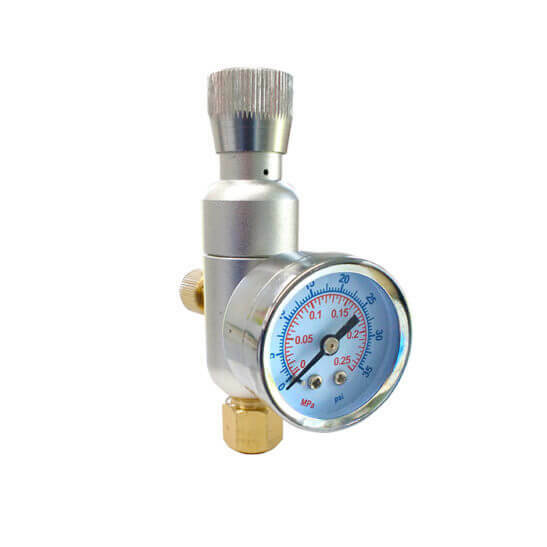 High-quality top-adjustable regulator features a side gauge, 5/8″ thread CO2 fitting, and 1/4″ MFL outlet. CO2 inlet is sized to accept standard 74g CO2 cartridges; outlet is sized for MFL-threaded ball- or pin-lock disconnects. Also includes adapter to mate 16g cartridges to the inlet. It’s everything your customers need to take fully controlled keg charging with them anywhere.